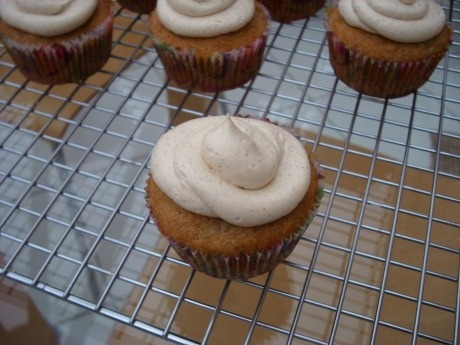 Banana Cupcakes with Honey-Cinnamon Frosting – Siren, refined. I served these at my recent housewarming party and they were a huge success. The original recipe (find it here) called for 1 ½ cups mashed bananas, but I was worried that the muffins would come out too dense, so I substituted half the bananas for buttermilk. Also, if you want to make the recipe go further (like I did), use a mini muffin pan and start checking the cupcakes after 10 minutes in the oven. 1. Preheat oven to 350 degrees. Line a standard 12-cup muffin pan with paper liners (or a 24-cup muffin pan if you want mini-cupcakes). In a medium bowl, whisk together flour, sugar, baking powder, baking soda, and salt. 2. Make a well in center of flour mixture. In well, mix together butter, mashed bananas, buttermilk, eggs, and vanilla. Stir to incorporate flour mixture (do not overmix). Dividing evenly, spoon batter into muffin cups. 3. Bake until a toothpick inserted in center of a cupcake comes out clean, 25 to 30 minutes (10-15 minutes for mini-cupcakes). Remove cupcakes from pan; cool completely on a wire rack. Spread tops with Honey-Cinnamon Frosting. Just before serving, peel and slice a banana into rounds, and place one on each cupcake, if desired. 1. In a medium bowl, using an electric mixer, beat confectioners’ sugar, unsalted butter, honey, and ground cinnamon until smooth, 4 to 5 minutes.